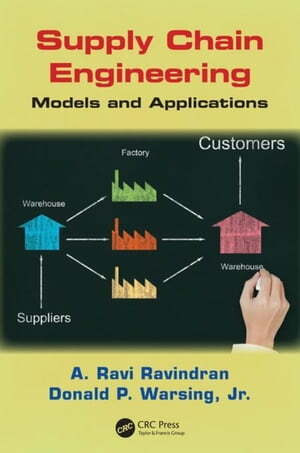 Collins Booksellers - Supply Chain Engineering: Models and Applications by Ravindran, A. Ravi, 9781466583320. Buy this book online. The authors have carefully constructed the book so that it is not so "micro" in its focus that the perspective on the larger business problem is lost, nor is it so "macro" in its treatment of that business context that it fails to develop students' appreciation for, and skills to solve, the tactical problems that must be addressed in effectively managing flows of goods in supply chains. Building students' knowledge of the first principles of supply chain engineering, the book covers the traditional issues in operations, logistics, and supply chain management-forecasting demand, managing inventories, managing transportation, and locating facilities. It also includes a number of new optimization tools such as risk pooling, for addressing these problems, based on recent research. In addition, the authors' treatment of managing customer-supplier relations supplies a fresh perspective that draws on recent research using multiple criteria optimization methods. Moreover, the chapter on managing risks in supply chains presents important problems that extend beyond the traditional treatment of supply chain management. Building a bridge between theory and practice, the authors pull all of these themes together in the culminating chapter that solidifies students' understanding of managing global supply chains.